“Hodag” (W5955-1), round white variety for chip processing. Specific gravity and maturity are similar to Snowden, but Hodag maintains light chip color 4–6 weeks longer in storage and has improved scab tolerance. Hodag is high-yielding, with larger average tuber size than Snowden. “Red Endeavor” (W6002-1R), high yielding red variety. Red Endeavor is late-maturing, comparable to Chieftain, and performs best when grown for 120 days before vine desiccation. per plant. Oneida Gold is moderately resistant to common scab and Verticillium wilt and extremely resistant to hollow heart. Tubers have shallow eye depth and mild skin netting that polishes off. A team of UW-Madison researchers has developed a superior white potato variety for chipping, called “Mega Chip.” This variety shows good chip color when processed from the field and maintains its color through five months storage at 48 degrees Fahrenheit. 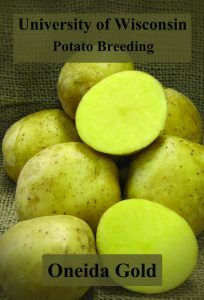 It also exhibits greater resistance to common scab, a major potato disease, than the leading variety Snowden. The round-oval tubers have white, slightly netted skin and white flesh. This variety also has high specific gravity and low sugar content. The inventors have now developed a line of dual-purpose potatoes, called “Millennium Russet,” which results in a long russet potato. A dual-purpose potato superior to Russet Burbank would be valuable to the fresh potato and french fry markets. Under Wisconsin conditions, this new line represents a significant improvement over the Russet Burbank variety. The line yields long, russet-skinned and white-fleshed tubers with medium-late maturity. A team of UW-Madison researchers has developed a new red skin potato line, called “Villetta Rose,” for fresh market, canning, and gourmet use (steamers). This variety has medium-late maturity and is particularly well-suited for canning. It has high tuber set; a uniform, round tuber shape; smooth, shallow eyes; uniform tuber size; good skin set; dark-red color at harvest; and white flesh. The tubers have a very attractive appearance. They are somewhat smaller than comparable varieties and the yield is in the medium range. This plant variety is a new potato line for chipping, called “White Pearl,” which holds outstanding potential for long-term storage at temperatures below the current industry level. Chipping quality can be maintained during storage for up to nine months at 42 degrees Fahrenheit. Tubers have light netted skin and white flesh and are very uniform with a medium-size profile. The variety also exhibits medium-late to late vine maturity, medium yields, and medium solids. A team of UW-Madison plant breeders has created a new, dual purpose (process/fresh market) russet potato that is adapted to the short season conditions of central Wisconsin. This variety, ‘W 1836-3rus,’ has long, blocky, russet tubers with light eye spots and an attractive appearance. W 1836-3rus also has medium-late vine maturity. The fresh red potato market represents 10 to 15 percent of the total Wisconsin potato market. The inventors have developed a new fresh market red potato variety, called W1100-R or “Red Companion.” This line yields tubers that are large, red-skinned, white-fleshed, and round-oval in shape. Red Companion shows better yield, fewer internal defects, better chip color, higher solids (allowing frying and baking), and greater resistance to blight than the most similar current variety, Dark Red Norland. A specialty market for small tubers less than 1 7/8 inches in diameter is a new and growing area in the restaurant food industry. The inventors have developed a red potato line, called W84-75R or “Red Pearl,” which is targeted toward this specialty market. 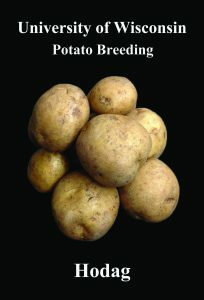 This potato line consistently produces uniform tubers with a round-oval shape, deep red skin, and white flesh. In addition, the line produces yields in which 50 to 70 percent of the tubers are less than 1 7/8 inches in diameter. The vines and tubers of Red Pearl mature midseason. This invention provides W1386, a potato variety well suited for potato chip processing. W1386 is a round/oval, white-skinned potato. The graduate students in the PBPG program work and study hard. But as members of the Plant Sciences Graduate Student Council, they also plan social and career activities together. Go here to learn more.